The Other Boufs: Mommy, Daddy, Katie, Timmy ... and more! : Friday Foto Finish Fiesta - A Cloudy Day...Goodbye Sunny! Friday Foto Finish Fiesta - A Cloudy Day...Goodbye Sunny! This adorable little puppy came into our lives in November 2003 and miraculously these are the first digital pics taken after my Great Computer Crash of 2003 (when I lost ALL pics from June 2003-October 2003, including all honeymoon pictures). 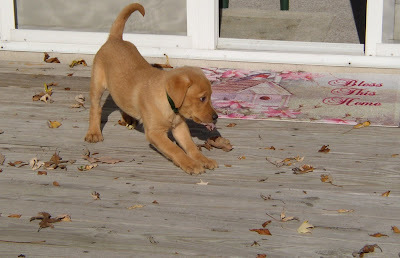 My mom had bought a house with my now step-dad Jim and they decided to have a baby together...of the canine variety. 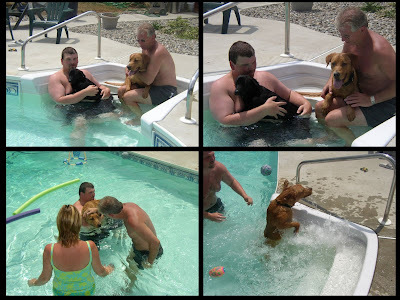 A pure-bred labrador retriever "with papers", Michelle's Sunshine was affectionately known as Sunny. 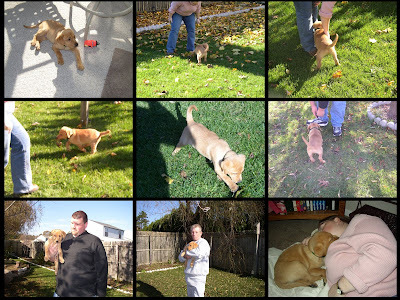 We had the honor of dog sitting Sunny several times. 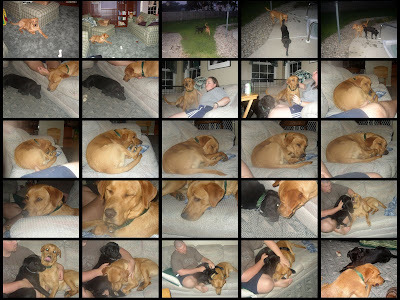 He was always such a good dog and he and Lucky had SUCH a great time playing together! Sunny got sick over a year ago. After almost losing him, he was diagnosed with a very dangerous disease - but a disease that was manageable with very expensive medication. He had bouts of sickness but had been doing really well. Wednesday night we went over my mom's house and were met with a playful Sunny running out to the car to meet us. Katie had a great time playing with him in the snow in my mom's backyard. Last night, my mom called. She went down to let Sunny out and he didn't wake up from his nap. We have no idea what happened. He was stable on his medication, had been acting fine all day, and just the day before was being as playful as ever. He was only 6 years old. We are so sad. I don't have any recent pics of Sunny, but of course it's probably not best to remember him with the "interesting" half buzz cut he received this past week :) We'll remember Sunny golden and regal, before he was sick at all...very sweet and such a good boy. today to see who else is sharing their Phantastic Fotos this week! Aww..Poor dogy. And what a beautiful fella he was. Sorry about your loss. I am sure it's terrible for your poor mom & stepfather. Awwww :( I'm so sorry to hear about Sunny. What a great name though!! So sorry! He was a beautiful dog.